Spice up a family favourite with these quick and easy recipe ideas. Chicken breast is a great ingredient to use any night of the week. But because both the chicken bone and skin has already been removed, it can often lack flavour when cooked. So we’ve put together a list of quick and easy recipe ideas to turn a simple chicken breast into a delicious, mouth-watering meal! Marinating is a great way to flavour and tenderise your chicken breast at the same time! When it comes to devising the perfect marinade, you’re really only limited by your imagination! 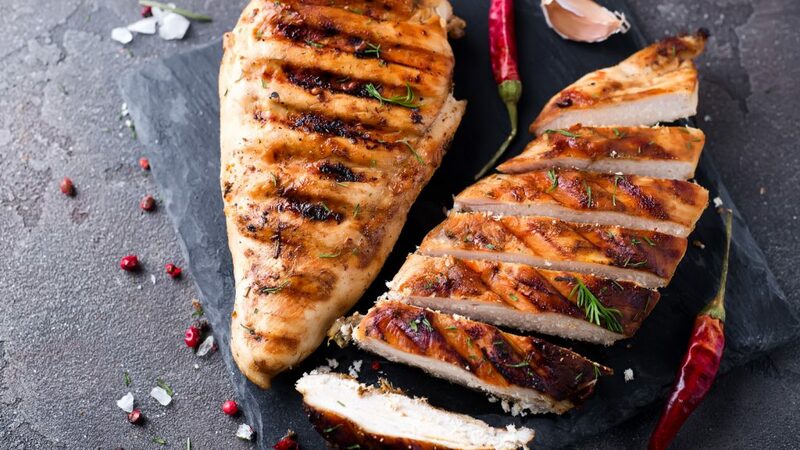 Greek marinade: For a classic Greek flavour combination, simply mix lemon juice, garlic, parsley, oregano with some olive oil then place your chicken breast in the marinade to infuse. It’s that easy! This marinade is perfect if you want to grill or pan-fry your chicken. Moroccan spices: Add a touch of spice to your chicken breast by combining paprika, cinnamon, turmeric, cumin, ginger, garlic and olive oil to create a paste. Then cover your chicken breast with the paste and pat down to secure. This Middle Eastern spice rub is delicious when charred on the grill. Maple glaze: If you have a sweet tooth, then this is the marinade for you! Mix maple syrup, garlic, soy sauce and lime juice with chicken stock then cook it on a low heat and let it thicken until it becomes a beautiful, glossy glaze. Once reduced, rub the glaze over your chicken breast and let it infuse. Don’t forget to put some aside to pour over your chicken when cooking for even more flavour! Remember, it’s best to marinate your chicken breast overnight to give the flavours time to infuse. A faster way to add flavour is to simply brine your chicken breast in salty water prior to cooking. This will help tenderise the meat and add extra flavour. Breading or crumbing generally involves dipping your chicken breast in flour, followed by an egg wash before coating it with crumbs. This coating helps protect the chicken from drying out during the cooking process so that you have a succulent, perfectly cooked breast every time. Chicken Schnitzel: The dish that we all know and love when we think of crumbed chicken has got to be the classic Chicken Schnitzel. Pounded with a meat tenderiser to ensure that it’s an even thickness all over for a constant cook and fried in oil, Schnitzels have stood the test of time as a classic whether at home or the local pub! Panko: If you want to get a little fancy with your breadcrumbs, give Panko a go. Panko breadcrumbs are used in many fried asian dishes and are made exclusively from white bread without the crusts. The bread is flaked before drying to increase aeration and ultimately crunchiness when used in cooking. The result when used on your chicken breasts is a crispier shell with a lot more crunch while the meat inside is still perfectly tender and protected. Coconut flakes: This technique is the same as other crumbing methods but uses coconut extracts in place of flour and bread! First, coat the chicken breast in coconut flour, then dip it into a mixture of coconut milk & eggs before finally rolling it in shredded coconut. Fry these off in coconut oil and you’ll be whisked away to a tropical paradise, even if it’s only while you’re eating dinner! Stuffed chicken breasts not only adds flavour to the meat while it cooks but can be a wonderful surprise when served at a dinner party. Simply slice the thickest part of the chicken breast to ensure you have enough room for your stuffings then use kitchen twine to secure it all in place while roasting in the oven. Medjool dates & fresh herbs: The sweetness of the dates and the fragrance from the fresh herbs makes this stuffing so delectable, your guests will be asking for seconds! First, cook a diced onion and set aside. Then roughly chop a handful of pitted Medjool dates, pistachio nuts, and fresh herbs such as parsley and sage. Mix together with breadcrumbs and the cooked onion and stuff into your chicken breast before baking. Brie and prosciutto with fresh tarragon: This stuffing is as delicious as it sounds and only takes a few minutes to prepare. Simply wrap a small slice of prosciutto around a piece of brie then tuck inside the chicken breast along with some fresh tarragon. The prosciutto will helps keep contain the brie as it melts so that it oozes out once your chicken breast is fully baked. There are so many great ways to add flavour to chicken breast so get cooking and feel free to share a photo of your dish with us on our Facebook page. Happy cooking!